I’ve shown you how to “Quickly Identify a player style” and how to counter a backhand dominant player. Today I will explain to you what is the best serve for Backhand Dominant player. I will also explain why Zhang Jike and Ovtcharov has developed their serve system: Reverse Pendulum Serve, Tomahawk serve and Backhand Serve. These serves are called “set up serve”, a tool to set up their Backhand attack. This tutorial will help you understand the mechanism of serve/returning serve. If you are a Backhand dominant player, you can develop your game serve and your Backhand attack. If you are a Forehand dominant player, you know how to counter the Backhand player in your friendly match, or your local tournament. Why does Zhang Jike use Reversed Pendulum Serve? Have you wondered why Zhang Jike prefer using this serve? Why does Dimitri Ovtcharov use Tomahawk and Backhand serve? There are 30% of Backhand player (Purple), and about 70% of Forehand Dominant player (Yellow). At the top level, you can see Zhang Jike is one of the best Backhand Dominant player in the world. 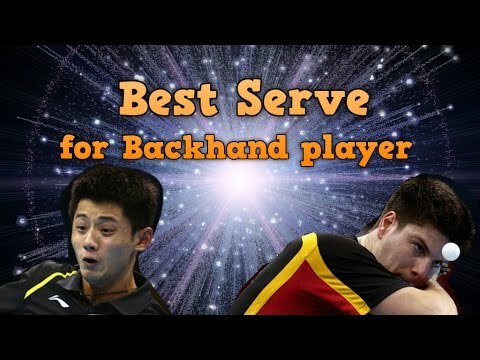 Dimitri Ovtcharov and Wang Hao are also considered as the best Backhand in the world. So Backhand Dominant player has many advantages compared to Forehand Dominant Player. In today modern table tennis, most players should develop their Backhand as a new weapon in table tennis. “Oh, they have a very good Backhand. I wish I can have the same Backhand like them”. However, not many of you understand that almost all of the best Backhand Dominant Players have their own serving system. In general, best Backhand dominant player out there has a “very good serve” or “best server of all time”. Ovtcharov is well known for his short Tomahawk serve and his Backhand serve. Wang Hao also sometimes uses some tricky serve and Reverse Pendulum Serve. Do you understand why? This is a “reverse pendulum serve”: it has so much side spin. The normal pendulum serve has a side spin: left to right spin. Zhang Jike’s serve has the reverse spin: Spin from right to left (anti-clockwise). That’s why this service is called “Reverse Pendulum Serve”. Because he is a Backhand Dominant player. The backhand player likes to stand at the middle of the table to cover as much area of the table as possible with his Backhand. the table, now he must move to hit Backhand). The mechanism of Backhand stroke is: Striking in front of the body, so Zhang Jike wants the return ball goes into his standing position (near the middle of the table or near his elbow). Zhang Jike uses this set up serve as he knows the ball will be returned mostly to the area between the middle of the table and his standing position, where he is standing and waiting to Backhand attack this ball. You should mention that after this serve, Zhang Jike moves immediately to the middle of the table (this position is the favorite position of the Backhand Dominant player). It’s very hard to return this ball to Zhang Jike’s wide Backhand or wide Forehand. The ball will be returned normally near the middle of the table. This is the advantage of this serve. Look at this serve, the return ball goes to Zhang Jike Backhand, but not the wide corner, It’s difficult for Wang Hao to return the ball to the wide Backhand of Zhang Jike because the ball has the side spin from the left to the right of Wang Hao. Wang Hao returned the ball directly to the Zhang Jike’s position. Zhang Jike is waiting to attack this ball. The ball is returned to the middle of the table, and Zhang Jike can also step around and pivot this ball. Wang Hao forehand-flipped this ball, and can only flip it to the middle or mid Forehand of Zhang Jike. Zhang Jike has totally a good control after this serve. That’s why the Backhand dominant player should develop a good “set up serve” incorporated into his playing style. Wang Hao backhand-flip this serve, and can only flip near the middle of Zhang Jike, and Zhang Jike is waiting for that. Fast Backhand loop on the table and win the point. So remeber, if you want the ball goes more to your right, use the Reverse Pendulum serve, to spin the ball from your right to your left, and the returned ball will go more to your right side (near the middle of the table). “Reverse Pendulum Serve makes the ball returned more to the middle of the table”. This is the Backhand serve of Ovtcharov. This serve has the same principal of Reverse Pendulum serve. It has side spin: Spin from righ to left. After the serve, Ovtcharov stays at the middle of the table, as he knows the ball will be returned to the middle position where he is standing. This is a tomahawk serve. It spins also from right to left. However, it’s difficult to make a short tomahawk serve. If the tomahawk serve is long, it will be attacked. The second tomahawk serve is better, the ball goes to the middle, and Ovtcharov Backhand counter attack to win the point. – Tomahawk serve: Be careful, train to do a short tomahawk serve. A long tomahawk serve is easily be attacked by the opponent’s forehand. I’m sorry that I can not answer all of your questions. I’m doing the videos during my spare time. I will try to answer your questions soon but slowly. If you really enjoy my videos, you can support me at https://www.patreon.com/EmRatThich. Your support will motivate me and I hope I can do more videos about our passion: table tennis.